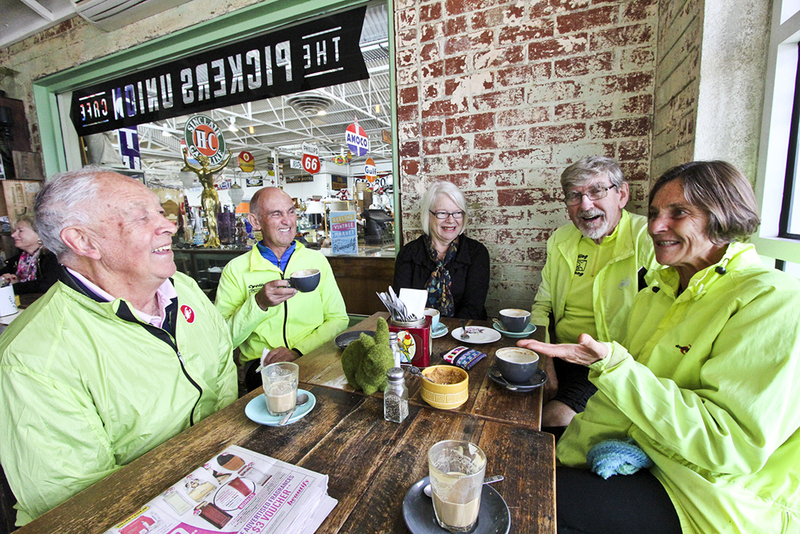 David, Russell, Rod and Helen set off from South Barwon Reserve for a relaxed tour of Geelong’s old industrial sites. Riding from Marnock Vale (near Balyang Sanctury) the cyclists passed through the first of several historic areas of Geelong’s old wool industry – passing the scouring mill in the river reserve, and the Riversdale Woollen Mill – the only mill that is still operational. The ride passed the old RSL Mill – noting that it is now home to art galleries and studios and was the original home of Deakin’s Fine Arts School (now at the Waterfront – also a new use for old mills). At Swanson Street, the ride went north – with a brief detour to discuss the future of the Geelong Gaol, recently reprieved from sale by the Geelong Council. Riding along Corio Street, old workers cottages sit amongst newly built homes. This area then gives way to commercial properties. At Yarra Street the gigantic Westfield Shopping Mall utilises Geelong’s other powerstation and at least two wool stores (unfortunately, the old brick powerhouse chimney on the corner of Brougham and Yarra Streets has been demolished). Yet more woolstores line Brougham Street. As well as those making up Westfield, beautiful Denny’s Woolstore now houses the National Wool Museum and Council Arts and Culture Department. Wool auctions are still held here. Deakin University utilises three further woolstores on the northern side of Brougham Street. The ride continued into Mercer Street, noting the original site of De Grandi’s – one of Geelong’s oldest bike stores, and the re-modelling of old hotels and industrial buildings into apartments. After riding along the waterfront, the main destination was reached – the old Geelong Power Station. This building has been opened up for public art. It’s an amazing site, and well worth a visit. Rosemary met the riders at this point. Coffee – Pickers Union in Mackay Street. Nancy was already there and had saved a table for the thirsty riders. The coffee was excellent and there was some browsing of the adjacent ‘antiques and old wares’ market. This is adjacent to yet another woollen mill – The Federal Mills, which house an array of small businesses including antiques and renovators wares and the also The Geelong Museum of Motoring and Industry – a ride destination for another time. Thanks to all for a most enjoyable mornings riding. This entry was posted in Ride reports and tagged North Geelong Powerhouse by hlyth2013. Bookmark the permalink.